Breast cancer is one of the most serious diseases plaguing modern-day women. At this time, there are more than 3.1 million women in the United States alone who have had a history with breast cancer, a number that includes both those currently undergoing treatment and those who have finished treatment. The focus on research, promoting awareness, and on providing early screening has led to a decreasing death rate, and 89.7% of women who were diagnosed with breast cancer survive for five years or more. On average, these rates have fallen by 1.8% each year since 2005. 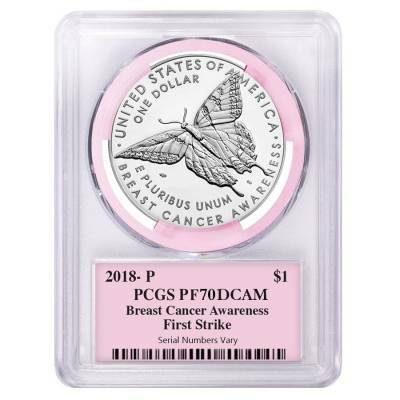 The 2018 P Breast Cancer Awareness Proof Silver Dollar Commemorative PCGS PF 70 First Strike has been authenticated as a perfect strike and earned the highest PF 70 grade from the Professional Coin Grading Service (PCGS). Because it was graded on the first day of release, it has additionally earned the First Strike designation. 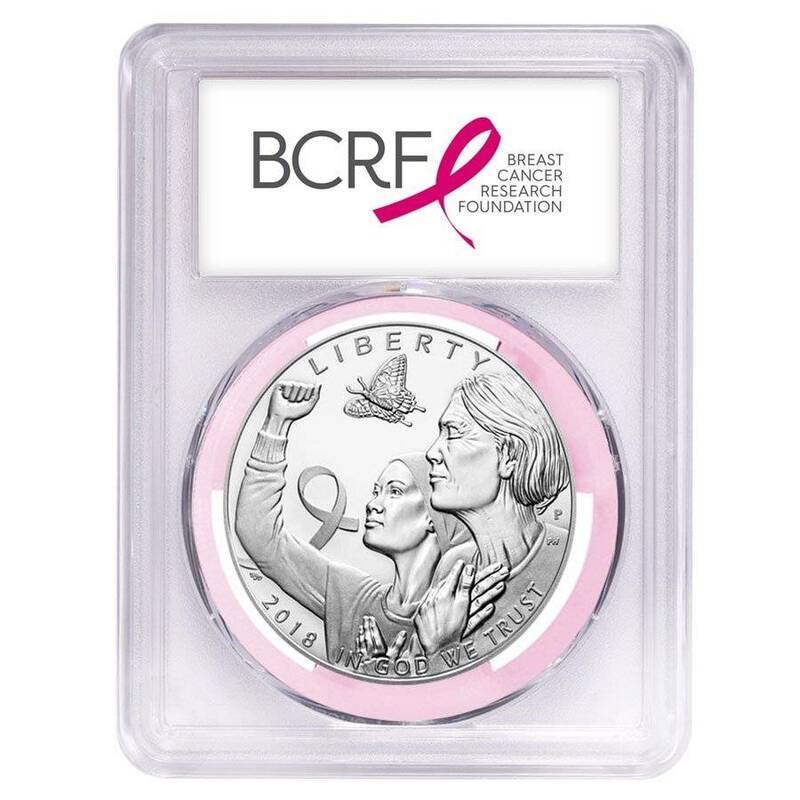 Obverse: Features an image of two women, with the older of the two clasping her hands to her chest in a symbol of gratitude and the younger pumping her fist into the air. The two stand against a background holding a ribbon and a butterfly in flight. They are encircled by the inscriptions “LIBERTY”, “IN GOD WE TRUST”, and the year of mintage. 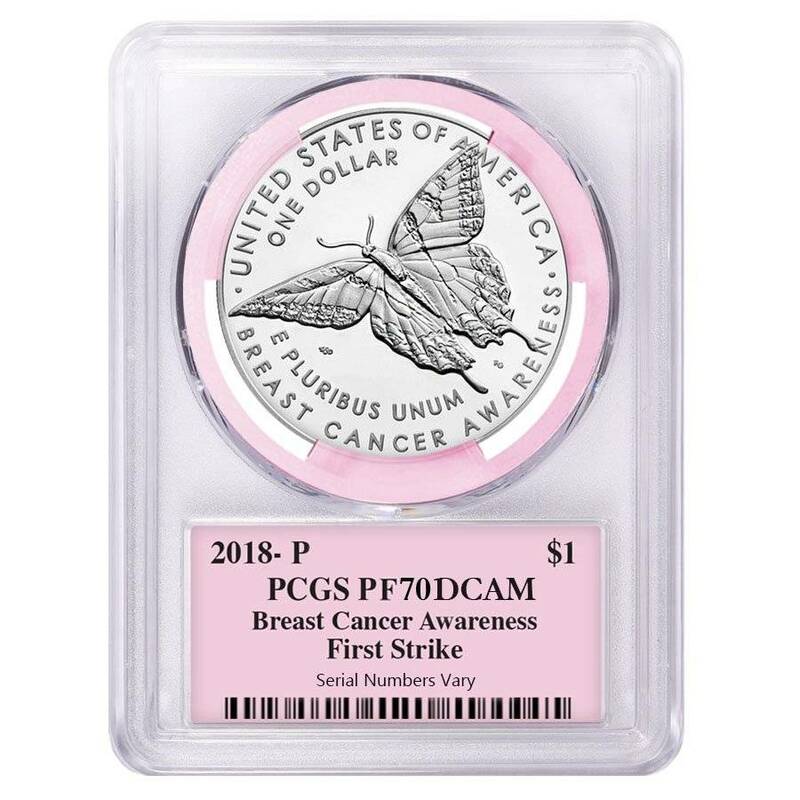 Reverse: Displays an image of a soaring Tiger Swallowtail butterfly, with the inscriptions “UNITED STATES OF AMERICA”, “E PLURIBUS UNUM”, “BREAST CANCER AWARENESS”, and the denomination. Bullion Exchanges offers you a wide selection of exclusive items from renowned international refineries. Add this splendid product to your collection today, and it will be carefully wrapped, packaged, and delivered to your address. For any questions, just message us, and we will be happy to assist you. These coins sold out pretty fast so I'm very happy that I got one. Placing my order was quick and simple. Thanks a lot, Bullion Exchanges! For every $1 spend, you will earn 1 Bullionaire Buck which is equivalent to $0.001 off a future purchase. 117 BB = $0.12.